Stakeholders can be terminated on Carta through the stakeholder page. This will stop the vesting on any options or certificates. To terminate a stakeholder, you will still navigate to "Stakeholders" -> "All stakeholders." Find the stakeholder you are looking to terminate and select the drop down from the right side, "Terminate stakeholder." Enter in the date, type of termination and new relationship for the stakeholder. The date and termination type selected will be used to set the last day to exercise or repurchase the securities for the stakeholder. The post termination exercise periods can be set on the option plan or individual grant level. On this page, you will be able to confirm the address on file for the stakeholder as well as view sample previews of the emails that will be sent out. If you enter a new email address for the stakeholder, this will update the email address on the company stakeholder ledger. Due to security reasons, this will not impact the stakeholder's Carta account. The stakeholder will have to update the email address they use to log into Carta on their end. Note: for stakeholders that have unvested grants - emails will not be sent out. We are working on making this clearer in the workflow. 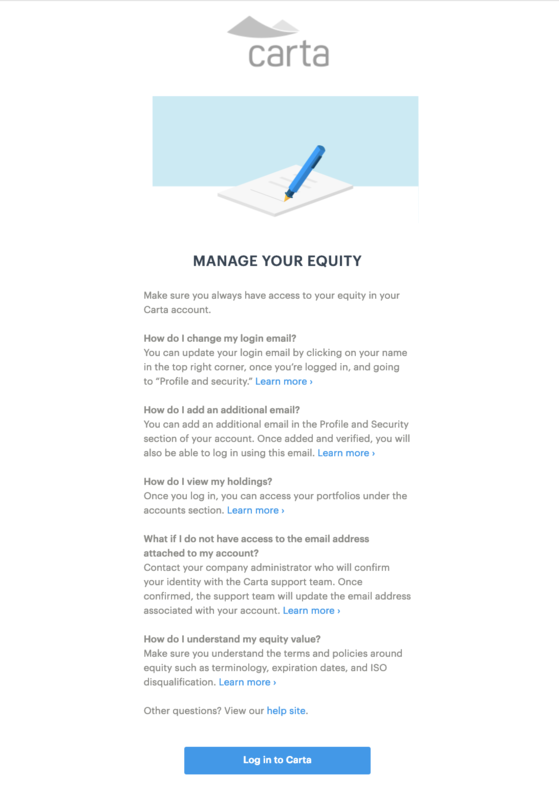 This email will be sent out on the termination date, however the content is focused on helping users gain access to their Carta accounts. 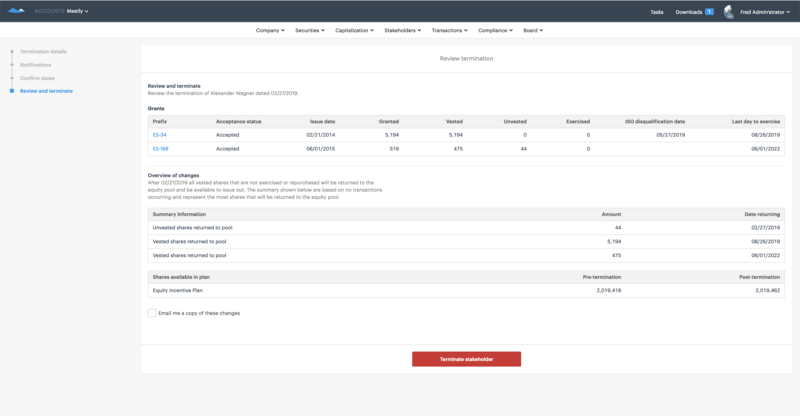 NOTE: If the Admin completes the termination workflow and reflects a future termination before the actual termination date, the notification email will be sent on date of termination entered. However, if the stakeholder logs in to Carta, they will see the termination reflected on their securities immediately. 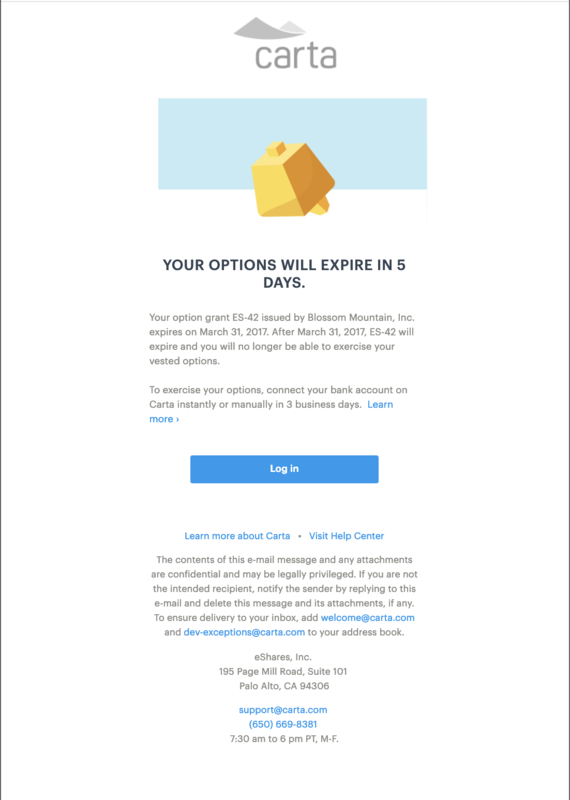 This email will be sent out at different intervals before the options expire. Verify the dates for the last day to exercise and the last day to repurchase. These dates will be auto-populated based on the information on the individual securities, however they can be updated as needed for each grant. Confirm that the amount vested and exercised is correct. Once dates are selected and confirmed, you will need to check the box to verify before continuing. Any certificates that need to be repurchased will have to be repurchased after completing the termination. Note: for stakeholders that have unvested grants - PTEP dates will not apply. We are working on making this clearer in the workflow. Review all the information for the termination as well as the overview of changes. You can also send an email record of the termination details to save for your own records. The first sections shows information for the stakeholder being terminated, the second section provides an overview of the potential impact on the captable. If there are repurchases that need to occur, the company admin will need to input the repurchase after completing the termination.